When I learned our first film would be a SILENT film, I thought this could be a long 141 minutes. Much to my surprise, I thoroughly enjoyed this movie! Just reissued in blu-ray, the movie had a wonderful score and its sepia coloring gave the film a feeling of warmth. I also hadn’t imagined the visual history lesson a film, produced in 1927 portraying events surrounding a fairly recent WWI, could provide. Although the story had some familiar themes of love triangle and men going off to war, it is possible this may have been new film territory. I was amazed at the technical quality of the production especially the dogfight scenes. The acting was solid and I guess one should expect expressive faces and mannerisms from silent film stars. Even got to see a brief scene with a young Gary Cooper! The glimpse into life in Paris and America in the early 1900s was especially memorable. As this is the first movie we are rating I wasn’t sure where to start but 8.0 seemed like a good place for a film I thoroughly enjoyed but knew I needed room to place films that I’m sure will evoke greater emotion and/or amazement. Let the film history tour commence…. Wings was the first movie to ever win the award for Best Motion Picture at the Academy Awards. However, contrary to the modern incarnation of the award, the award was actually dubbed Most Outstanding Production. Wings was also the only silent film to ever win the best picture honor, and that makes sense because it fell on the cusp of the new technology of sound becoming a viable option for film productions. While there had been short films in the past synched up to record players, 1927 was the year when the first “talkie”, The Jazz Singer, premiered. 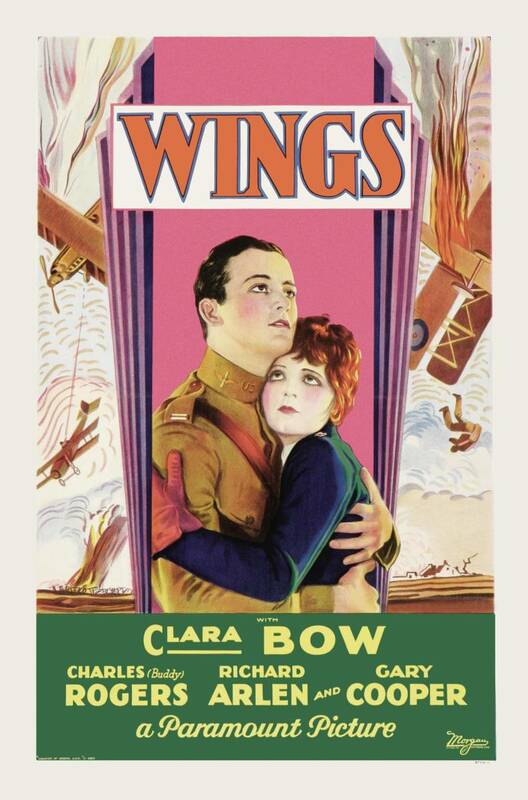 Wings was given the daunting task of providing the last hurrah for silent films as Hollywood entered a new era. Now in order to notify a reader of any possible bias in my writing, let it be known that I do not like silent films at all. I understand their historical significance but in the modern era I find it quite archaic to watch actors move their lips and wait for the title screen to tell me what a given exchange was about. I sometimes even prefer to pretend I am in Mystery Science Theater 3000 and make up the possible words they could be saying, but that is just my personal preference. With those concessions made however, I enjoyed Wings more than I thought I possibly could. It takes about the first 20 minutes of the movie for a modern movie viewer to get used to the format of the silent film, and as soon as you do the fact that this film has no sound suddenly dissolves into the background as you become enveloped in the bizarre love quadrilateral between Jack (Charles Rodgers), David (Richard Arlen), Sylvia, (Jobyna Ralston), and Mary (Clara Bow). The special effects for 1927 were honestly spectacular, and really put the awful movies Ed Wood-esque B Movies made in the 1950’s and 1960’s into perspective. The score also provided a decisively driving force in the film, even though we did hear the remastered 6.1 digital sound on our blu-ray copy, it still maintained the original score. The dog fights in the film were truly ahead of their time and the limits the filmmakers pushed their dated technology to really deserve praise and admiration. There were even parts of the film where plane crashes had been colored by individually tinting each individual frame, providing a particularly stunning visual contrast to the monotony of black and white visuals. Overall, I really enjoyed Wings more than I ever expected to, and is definitely in my top 10 favorite American silent films I have ever seen. If I were a moviegoer in 1927, I too would have wondered why sound was even important with silent films being able to provide such a spectacle of a production. If one has any interest in film history at all, I would highly suggest checking out this film. Also, made two years before All Quiet On the Western Front, it set the standard for production of war films, especially those about WWI.